“Working and Racing on the Bay: The Chesapeake Log Canoe” was on display at Jamestown Settlement through September 8, 2015. 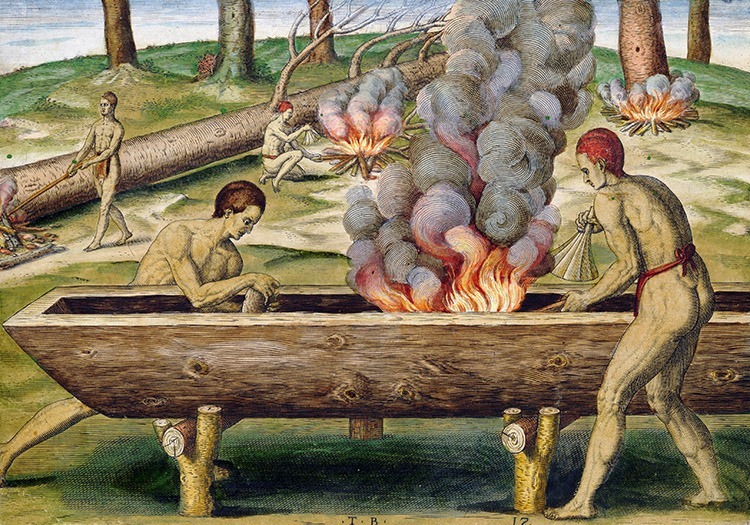 Curated by The Mariners’ Museum in Newport News, Va., and featuring objects from its collection, the yearlong exhibition traced the evolution of the dugout canoe through the centuries, from the watercraft of the Powhatan people 400 years ago to multi-log trade vessels and work and racing boats. Virginia Indians methodically fashioned canoes from single trees. Theodor de Bry colored engraving (circa 1590) after John White painting. From the collections at The Mariners’ Museum, Newport News, Va.
For more than three centuries, the log canoe was essential to life on the Chesapeake Bay, the United States’ largest estuary, for travel, harvest and trade. 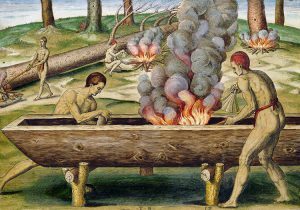 Fashioned from single trees by Powhatan Indians, the log canoe was the dominant watercraft at the time English colonists arrived at Jamestown in 1607. The suitability of this open, shallow vessel for navigating and fishing along the Chesapeake waterways led to its adoption and assimilation by European colonists using imported tools and technology. 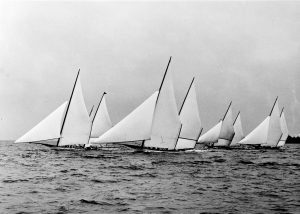 More than 100 objects from The Mariners’ Museum, including a dugout canoe, wood samples, photographic images, woodworking and boatbuilding tools, and scale models, illustrated the fabrication, employment, sailing and racing of the Chesapeake Bay log canoe. The exhibition looked at a variety of log canoes, methods of construction, and adaptations to the vessel fueled by the demand for tobacco and oysters on world markets. Key among these changes was the development of the multi-log hulls that allowed for larger cargoes to be transported more efficiently. Many log canoes took on the names of the localities in which the newly adapted vessels were designed, including Poquoson, Pocomoke and Tilghman Island. This circa-1945 photograph of a log canoe race on the Chesapeake Bay shows four vessels, from left, Magic, Flying Cloud, Mystery and Jay Dee. From the collections at The Mariners’ Museum, Newport News, Va.
By the turn of the 20th century, the racing of log canoes emerged from working boats dashing in competition from oyster bed to market in an effort to secure the best price for their goods. 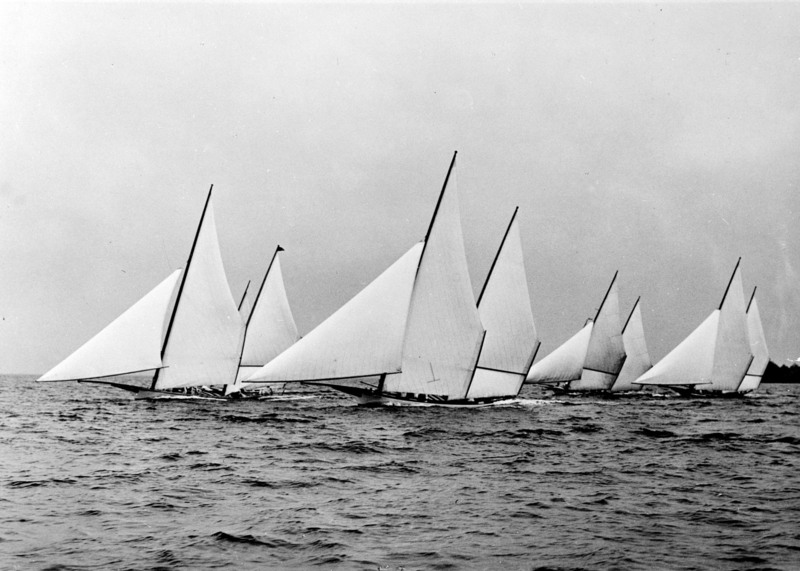 Thinner hulls and an enormous amount of sail transformed the workboat into a racing vessel. Annual organized racing competitions were held and continue today in the northern Chesapeake Bay. Learn more by viewing the exhibition brochure, Working and Racing on the Bay: The Chesapeake Log Canoe. The Mariners’ Museum in Newport News, Va., an educational, non-profit institution accredited by the American Alliance of Museums and designated by Congress as America’s National Maritime Museum, is dedicated to the story of mankind’s relationship with the sea. It is home to an international collection of art and artifacts, the largest maritime library and archives in the Northern Hemisphere, and the USS Monitor Center. 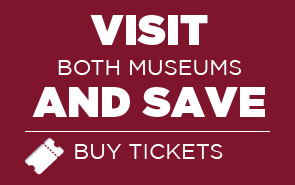 The special exhibition is funded in part by a grant from James City County with additional support from Mr. and Mrs. E. Peter Meekins, Altria Group and Dominion Resources, Inc.